John Morris has been a frequent traveler throughout his life. In 2012, he was involved in a horrific car accident. 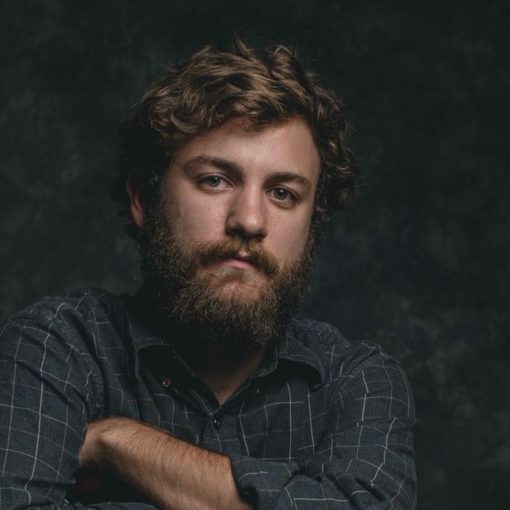 Driving across the country from St. Louis, Missouri to Gainesville, Florida – he crashed in the Atlanta, Georgia area. He spent nearly a year in the hospital, was in a coma for about a month, was treated in a burn unit, and eventually made a decision to amputate his legs, becoming a triple amputee – as one of his hands was amputated as well. It was miraculous that he even survived the accident to begin with, but after he did, he was told he would never be able to travel again. However, John did not allow a disability to hinder his passion – to travel. “I just felt as if I should be able to travel again,” he said. 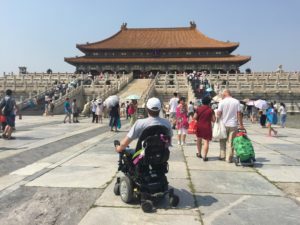 He was only in China for three days because he wasn’t certain about the accessibility for someone in a wheelchair. But what made the Great Wall of China accessible for him was the 2008 Olympics in Beijing. 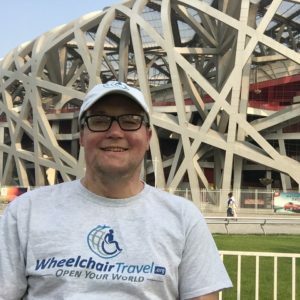 China had stepped up its accessibility for visitors coming in from around the world, including the Paralympians traveling there. 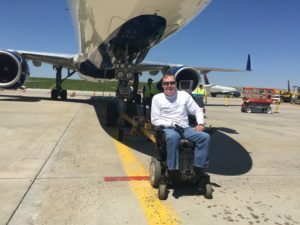 To date, John has traveled to at least 36 countries in his life – and has been to 30 of those countries since he started traveling in a wheelchair in 2014. 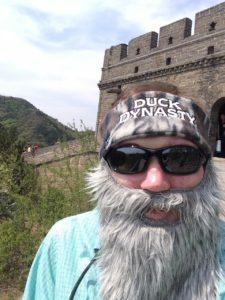 John makes it to the Great Wall of China – with his Duck Dynasty beard. Since 2014, John has taken many more trips to Asia – including to Seoul and Hong Kong. 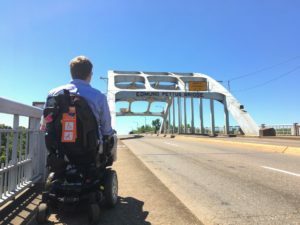 It was then that he started writing about accessibility issues because “there was virtually no information about access in these cities,” he said. John Morris visits an iconic symbol of the civil rights movement in Selma, Alabama. “Transportation is one of the most disabling things in America,” said Morris. 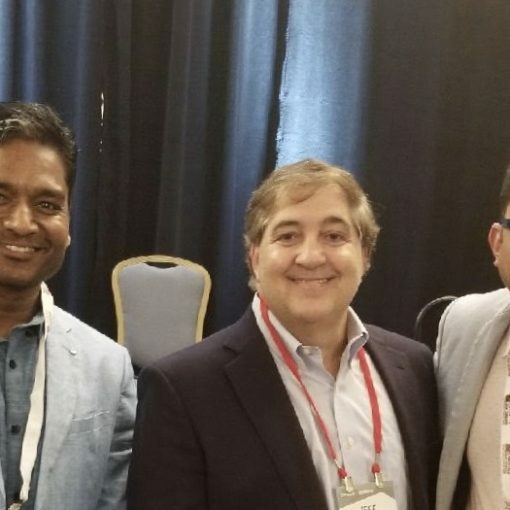 For those with disabilities, they have to search out answers to questions about how they get from the airport to the hotel, from the hotel to an attraction – and not just what route to take but how they will be transported there. When they are at home, they might have to search for answers on how to get to get to a doctor, for example. “There’s just not enough attention paid to ADA compliance or the needs of the disability marketplace,” said Morris. Results from the 2010 Census reported that nearly 20% of Americans have a disability of some kind – these include mobility impairments, intellectual disabilities or emotional challenges. 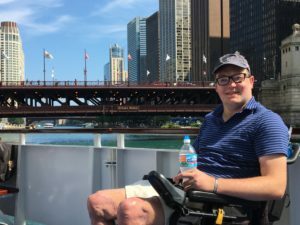 John hopes everyone – with or without disabilities – has the opportunity to travel. His advice to us: “Keep traveling.” It seems nothing will stop John Morris from doing just that. 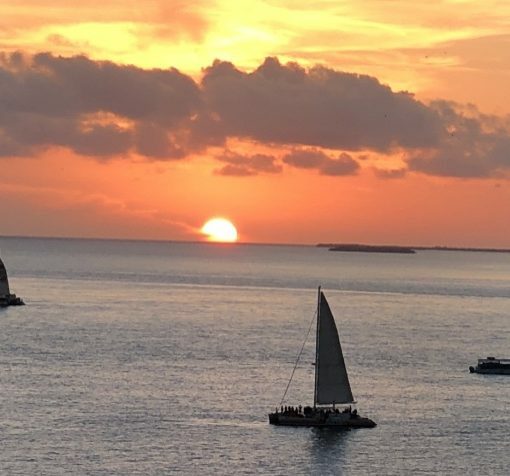 And he’s now in the business of helping others have that same opportunity – and take advantage of all the travel possibilities available to us. To listen to the full interview with John Morris, tune in to Episode 40 of the Agents of Innovation podcast on iTunes, Stitcher, or Soundcloud. You can also follow the podcast on Facebook, Instagram, or Twitter.